Hollyhocks in the backyard beginning to bloom. 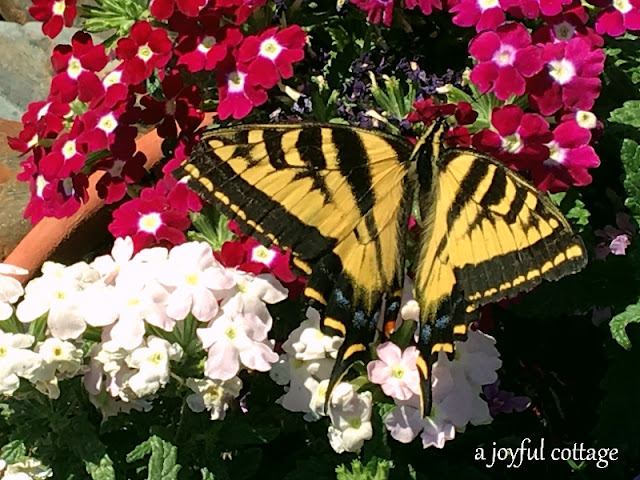 Western Tiger Swallowtail visiting my color bowl. I love the beauty of your flowers. I'm glad Dennis transplanted the Hollyhocks! 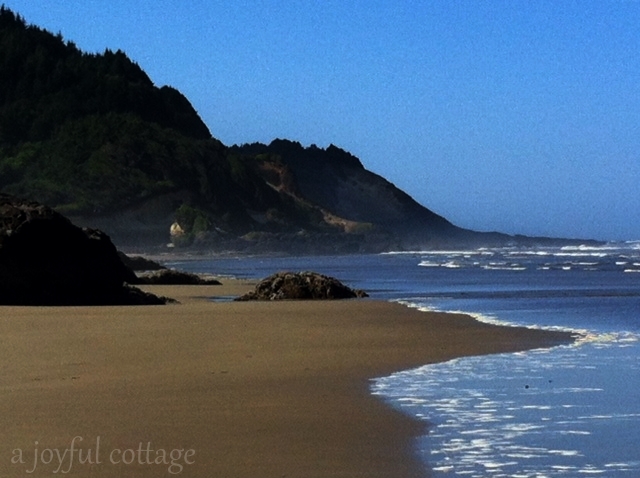 The Waldport area, just north of Yachats, is a favorite place of ours. We were there last Sunday and had a fantastic day. Enjoyed the flower pretties . . . Especially the HollyHock . . .
Hope you find some cool breezes somewhere today! 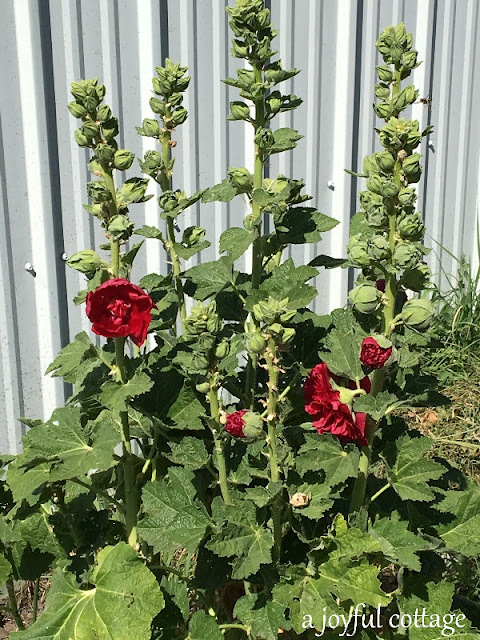 I noticed my neighbor's hollyhocks were blooming. I've always marveled to see hollyhocks blooming at abandoned farmsteads. They are hardy as the pioneers who planted them on their homesteads. Nancy you flowers are doing so well . 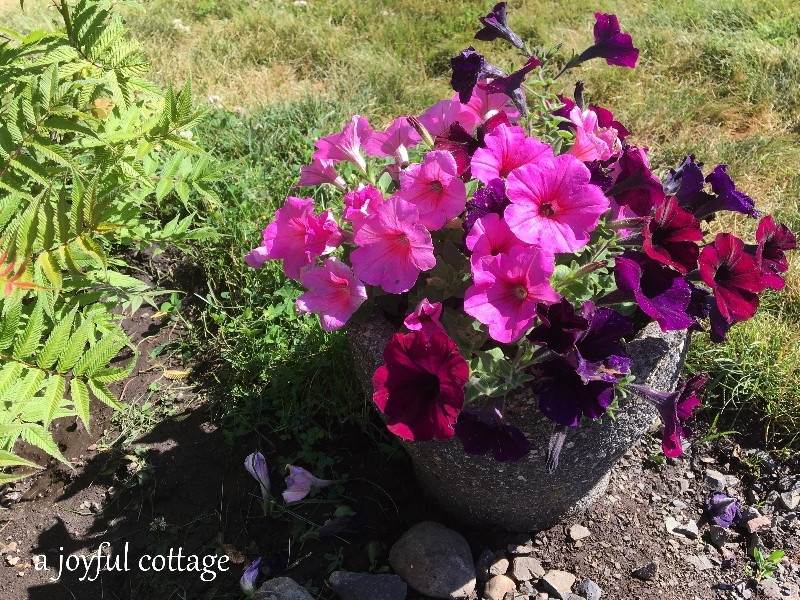 . . you have created a lovely cottage garden. I loved the post a few weeks ago when we saw the whole garden. Gardens filled with flowers and shrubs are what makes a beautiful place to me. Even the finest of homes looks dull and unwelcoming without a garden. My hollyhocks were amazing last year, then the winter took them out. I do have two coming up out by the compost pile, so maybe next spring I'll try transplanting them. Surely we won't have another winter like last year's, for a very long time. Beach photos always make me 'feel' cooler on a hot day. I can feel and taste the ocean breeze. Oh, how beautiful! I loved seeing the photos. It is so beautiful where we are, too. Rainy today, but making the river rise and even more peaceful to look at. God is good! Loved that you shared your random pretties with us. 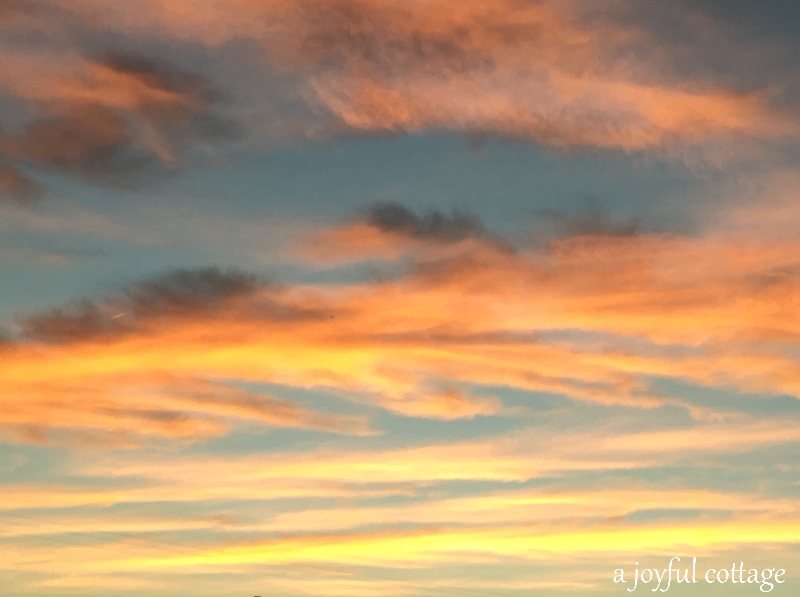 It is amazing at this time of year to look around and find a smile in so many things. Happy Friday. Have a wonderful weekend. Oh that ocean.....Nancy! Your hollyhocks are superb! Isn't it a great summer? I have been having so much fun just being FREE. Every day I feel like a little kid again, playing. I went to the lake yesterday with a friend for some photography fun, and we saw two giant turtles emerge from the lake. Small things like that make me feel YOUNG!!!!!!! What a gorgeous sunset, pretty flowers, a beautiful butterfly, and wonderful ocean view. Lovely photos! I love hollyhocks but they can't take the heat here. Thanks for sharing! That's interesting. I've seen them growing in Taos, New Mexico and it gets pretty hot there. We're experiencing temps in the high 90's here, so we'll see how it affects these hollyhocks. Hope they make it. My favorite beach quote is, " I go to the sea to breath ". Back from my travels, Nancy, and (almost) immediately back to blogging. Funny the things you miss when you are away. I would miss that beach as well, gorgeous, and VERY hot here right now. Your hollyhocks look so healthy. Mine always used to get rust and get eaten by bugs. They're such beautiful flowers, though. Maybe I'll try growing them again someday. Wow, what a sunset! July is a very colorful month here too and that color is mostly green right now. We have had so much rain that the foliage and grass is lush and very green! Alright, what is your trick with hollyhocks? ;-) I have only had one good year with them. Wow, that they transplanted to well. I do think they are beautiful. Random beauty is always worth noticing! That's a very beautiful sunset! I love watching the sky.